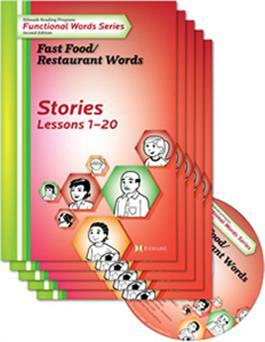 Functional Words Series, Second Edition Stories provide an entertaining reading experience and extensive practice in reading and using the Functional Words vocabulary. The stories contain realistic characters and settings. The plots involve school, community, and job interactions. Many stories include themes of friendship, family, and pets. The stories include multiple meanings for the vocabulary and portray the words being used in a variety of situations. Teaching the Stories and Stories Activities may increase students’ understanding and use of functional vocabulary and may enable them to generalize that understanding to new settings and situations. The stories are written using the words taught in Levels 1 and 2 of the Edmark Reading Program, Second Edition, and the Functional Words Series. Each kit contains five books that cover 20 lessons each: Lessons 1–20, Lessons 21–40, Lessons 41–60, Lessons 61–80, and Lessons 81–100. One story is provided for every two words taught in the lessons. These target words are the focus for the stories and stories activities. Once a word is taught, it may also be used in subsequent stories within the kit. Some words used in the Stories are new words, such as compound words, irregular verbs, and contractions. Appendix A lists the new two- and three-letter words that were needed to facilitate story construction. Other new words may be the names of characters or words necessary for a story plot. Any new words that are introduced in a story appear with an asterisk next to them in the Before You Read the Story section of the Stories Activities pages (provided on the CD-ROM). Introduce new words to students by making flash cards and having students practice recognizing them on sight.